Get ready for an extreme challenge that will have you burning fat, boosting your metabolism, and getting LEAN with ChaLEAN Extreme®, my incredible new workout system that has transformed everyone in my test group with 3 simple words: MUSCLE BURNS FAT®. It's a fact. If you develop lean muscle you will burn fat. Think about this: you can burn up to 60% of your total body fat in only 3 months and see visible results every 30 days—GUARANTEED! My proven technique shifts your fat-burning focus from cardio to resistance training. By adding resistance training in 3 phases, you'll build lean muscle, and that's what supercharges your metabolism so you burn fat long after your workout—even while you sleep! You Get 15 Workouts! Remember - Muscle Burns Fat! Chalene teaches you the proper form and technique for the resistance moves you'll be doing in the program, whether you're using weights or bands. PHASE 1: BURN You start lifting weights to jump-start your metabolism and break down those "extra" reserves of fat. In these moderate training workouts, you'll work your upper body then lower body, and learn how "Lean Phasing" will help you see major results every 30 days! PHASE 2: PUSH Chalene shows you how to lift heavy—beyond your comfort zone—so you build the muscle you need to burn fat. Chalene makes it easier than it sounds with incredibly fast results. PHASE 3: LEAN Here is where you really bring it home with new routines and dynamic moves that literally melt the fat off your body. You will be blown away with jaw-dropping results and rewarded with a brand-new body! What Comes with My ChaLEAN Extreme Kit? 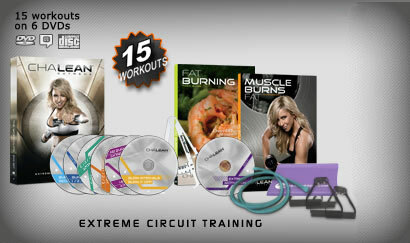 Your ChaLEAN Extreme kit comes packed with information, workouts, tools and recipes. Let's be clear: you're not just buying a couple of DVD's. You're buying a lifestyle change, and ChaLEAN Extreme steps up to the plate. Not only do you get the 15 workouts on the 7 DVD's mentioned above, but you get a 103 page Fat Burning Food Guide that details not only the ChaLEAN philosophy and guidelines for getting lean, but over 80 recipes to help you do so. It's a ton of information for you to absorb, learn from, and then implement. You also get the 89 page Muscle Burns Fat Guidebook, wherein the science behind ChaLEAN Extreme is explained, along with a host of success stories, advice on how to prepare, how to exercise, and how to maximize your results. But there's more. In addition to all this, you get a Sculpting Band, Body Fat Calipers, Chalene's Healthy Eats and Kitchen Makeover DVD, and the Extreme Motivation CD to help you get pumped and moving to Chalene's favorite workout beats! You have several options when it comes to upgrading your basic package. The most complete and intense is the ChaLean Extreme Deluxe package, which comes with the basic package PLUS 7 new DVD's, Weighted Gloves to increase the intensity of your workouts, 2 Resistance Bands and a Stability Ball. Or, if you already own the basic package, you can simply buy the Deluxe Upgrade Kit, which comes only with those extra items. Of course, if you just want the DVD's, you can opt to either buy the Extreme Deluxe DVD's which comes with all 7 new workouts, or the most basic package, the Extreme New Deluxe DVD's, which only comes with 4.